“Challenging the Norm” is the theme of the fifth annual Decom Offshore conference, which is principally sponsored by Bureau Veritas UK, and takes place on 24 May at Aberdeen Exhibition and Conference Centre. The day’s programme will review the progression of the decommissioning sector, discussing and challenging the current decommissioning “norm”. The expected 400 attendees will hear from keynote speaker, Centrica’s Managing Director of Exploration & Production, Chris Cox, followed by updates from key industry representatives, including the Oil and Gas Authority and Dutch body, EBN who will discuss their Decommissioning 100 Day Masterplan and Dutch Opportunity. The regulators will share the agenda with several operators - including Maersk and ENGIE E&P Nederland B.V.
Delegates will also have a choice of three break-out sessions, covering the topics of Wells Technology Today, Onshore Decommissioning Opportunity and Alternative Removal Technologies. New for 2017’s programme, a “Question Time” panel session chaired by Mark McAllister, chairman of The Decommissioning Company, will also allow the audience to put their questions to several key sector stakeholders including the Scottish Fishermen’s Federation and Marine Scotland. The conference will include One-to-One sessions, with particular emphasis upon supply chain export opportunities via expertise of the Decom North Sea’s board of directors and guidance from Department for International Trade and Scottish Development International covering Asia, Canada, China, Denmark, Mexico, Norway and The Netherlands. With over 30 exhibitors expected, the conference will also provide an excellent opportunity for the sector to showcase innovative products and solutions. 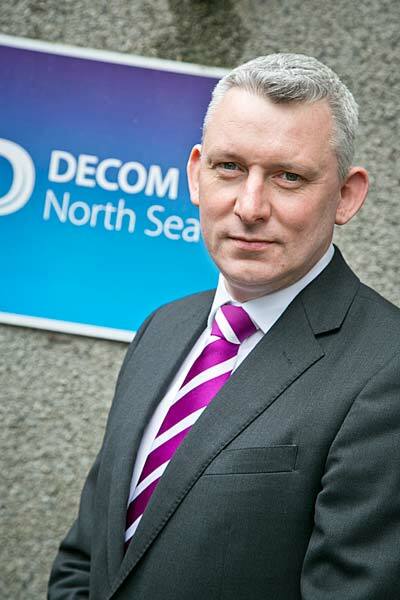 Commenting on the event programme, Decom North Sea chief executive, Roger Esson says, “Decom North Sea exists to connect capability with opportunity across the oil and gas late life and decommissioning sector, and by “Challenging the Norm”, Decom Offshore 2017 is an opportunity for us all to focus upon the evolution of decommissioning.